Città di Kyoto is the most recent of Santa Maria Novella's fragrances. It was released in 2005 to mark the fortieth anniversary of the sister-city link between Florence and Kyoto. The notes include iris for Florence and lotus for Kyoto; other notes include bergamot, orange, jasmine, hyacinth, rose, hawthorn, ylang-ylang, plum, peach, cinnamon, cypress, lavender, birch, sandalwood, gaiac wood, cedar, ebony, patchouli, ambergris and vanilla. The citrus in the opening of Città di Kyoto is very soft and mild, and layered over prominent notes of hawthorn and iris. As it settles, the other floral notes join in, and there is a touch of sweet fruit, but happily (for me, anyway) no more than a touch, with a hush of spice in the background. The dry down centers on the wood notes, but with nothing like the clarity of Comme des Garçons Kyoto; here the woods are cushioned by the silky-powder finish of the iris and sweetened by the florals and a whisper of vanilla. The first time I tried Città di Kyoto I thought it was nice but perhaps no more; on subsequent tries it has grown on me. Despite the profusion of notes, it is an understated fragrance, with a serenity that calls to mind Frederic Malle's L'Eau d'Hiver — but only in the vaguest possible way; they don't smell much alike other than the common notes of hawthorn and iris. Like Hiver, it evokes a cold, cloudy day, but as fragrances go, this one is fairly seasonless, and I should think it qualifies as unisex, although if it leans in one direction, I would say that direction is feminine. 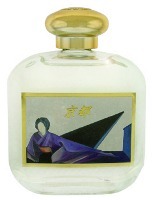 The (gorgeous) 100 ml bottle of Città di Kyoto Eau de Cologne is $84. For buying information, see the listing for Santa Maria Novella under Perfume Houses. Great review! On my skin, this had a dry grassy and sort of powdery-earthy quality. It'd make a great comfort scent. Love the bottle! I tried it a few times, but I could not make up my mind about it, because I was a bit bothered by the sharpness of its woody base. I should revisit it again. Excuse me, but Eau d'Hiver evokes a cold, SUNNY day. So there. And as for the new SMN, it has far too long a name—six words at last count. Brevity is the soul of wisdom, you know. Or is it the seat of wisdom. One of the two, I'm sure. It is easily the nicest bottle they've done…very tempting! V, that part doesn't bother me. I wasn't sure about the sweetness myself, and perhaps I should quite have called it seasonless — it might be too much on a very hot day. We are having very cool weather here today for June and it is perfect. Really, a sunny day? And how is Citta di Kyoto six words, ma'am? I didn't like Citta di Kyoto when I first tried it. But after retesting, it has become a major obsession. (Must get a bottle!) I love the contradictions of this scent. On the one hand, I find iris rather melancholy. But it's balanced by the uplifting citrus and woods. Overall, the effect is very calming and balanced. Wow, I love reading all the different takes on this one. On me it is a woody, meditative Japanese-style incense with a little floral in the background. I find it to be a radical departure from the rest of the line that I have tried, although I'd love to try that weird one (Nostalgia?) someday… for me this was definitely a fragrance that increased in appeal over several tries. Interesting that I'm not the only one who wasn't impressed at first sniff. I would call it calming & balanced too. Wow! UPS guy just delivered a box from Lafco! And here is my sample of Citti di Kyoto. Just sprayed it . . . smokey? Where is that coming from? Not fungy nasty ashtray, but ashtray in a nice way. I'm new here, and just learning. Anyone know where the smoke comes from? Anyone get that? It is lightly incense-y in the base, but don't know that I actually find it smoky — but then again, it's actually been awhile since I've worn it. Hi . . and yes. Must be the incense, maybe burning incense. btw, I've been looking around on this site for travel shopping tips. I found the notes from guest shoppers, but they are in a “can't reply” format. So I'll ask you: Know any good perfume shops in San Juan PR, or Philipsburg, St. Maarten? Going on a cruise next week. I love St. Thomas for perfume shopping (Tropicana and Little Switzerland come to mind.) but cruise not stopping there this time. I think there may be a Little Switzerland in Philipsburg, but maybe only jewelry? Do you know of any niche perfume availability on either the French or Dutch side of St. Maarten? Or PR? Sorry, I don't know a thing! Hope you'll find some wonderful shopping though. And jealous of your trip — sounds perfect.